Delicious and adorable! 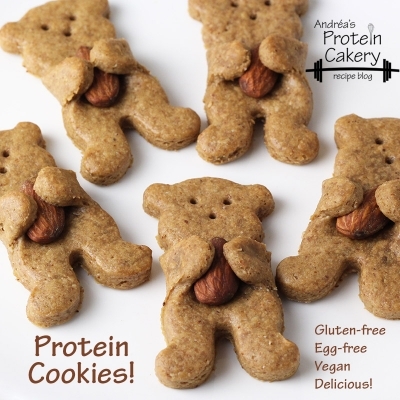 These protein cookies are full of flavor! 1. Mix almond butter, water, maple syrup, vanilla, and salt. Mix well. 2. Add rice protein, and mix to combine into dough. If the mixture is too dry, add water by the teaspoon. If the mixture is too wet, add rice protein by the tablespoon. 3. Place the dough on a sheet of parchment paper, and roll (or press with the heel of your hand) so that the dough is flat and just large enough to make 12 cookies. If you roll the dough to be too thin, the bears won't hold their shape as well. 5. Remove the dough from the freezer, and preheat oven to 325F (163C). 7. Using your cookie cutter, press and cut one bear. Before you place it on the cookie sheet, place the almond in the center of the cookie, and wrap the arms around the almond. Then place on cookie sheet. 8. Repeat to make 11 more cookies. 9. Use a toothpick to make holes for the eyes and nose. 10. Bake for 10-12 minutes, until firm. 11. Let cool, and enjoy! These should stay fine at a cool room temperature, or in the refrigerator.